Well, the race didn't get off to a good start when I was putting on my wetsuit and I put my finger almost all the way through it! I was just pulling it up and felt it rip...not good 15 minutes before the start of the race. 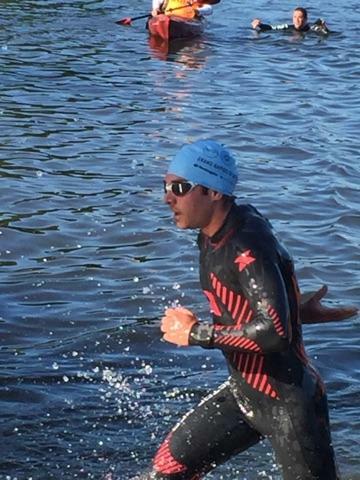 Fortunately, it didn't seem to affect my swim much and I was able to hold a pretty good pace. The swim start was a little chaotic, though. A few guys were trying to go out way too hard for their abilities and I was getting dunked for a bit. After a while, I was able to hook onto uppercase Todd's feet (or Todd Kennedy as he also goes by. He's uppercase and I'm lowercase :P) and ride with him for the rest of the swim. It was easy to find him because he wears a bright orange wetsuit! Thanks Todd! On the way back, the volunteers told us to swim toward the giant pink waving guy. Unfortunately, it was impossible to see anything because we were swimming directly into the sun. I noticed that Todd stopped to site a few times so he could actually see where we were going. We went a little off-route on the way back that Todd figured cost us about 20-30 seconds. We finished the swim in 20:43 (1:15/100y) and mom said I was 4th out of the water! I came out ahead of Todd and right behind another speedy friend Louis Cayedito. Since I was right behind Louis, I was focused on staying close to him running through transition. I knew we were racked around the same place so I was just following him. After a minute, I noticed he was turning around and running back the other way. He had overrun his rack! YES! Now was my time to make up so ground on him. Unfortunately, because I was so focused on him, I had also run past my rack. DANGIT! He came out of T1 just ahead of me and I was just going to try and keep him in sight on the bike so I could run him down. For the first half of the bike, I was keeping Louis pretty close. I took a few splits and noticed his gap was only growing a couple seconds every few miles. At the turnaround spot, he had opened up about a 30 second gap on me which was right where I wanted to be. If I could keep him within a minute, I was sure I could run him down at the end. My HR seemed to steadily decrease throughout the ride which means I could probably push harder in the later stages. I guess that's good news for the future, but not so much for this race. As I was running out of T2, I got a few different reports of how far back I was, ranging from 1-2 minutes. When dad told me I was 2 minutes back, I just kind of shook my head and thought that was too much to make up. Louis's time out of T2 was 1:20:38 and mine was 1:22:16, so he was up on me by 1:38. I got out on the run and was just trying to keep a steady pace. Since Louis was so far ahead, I just wanted to hold a good pace and see if I could put some time into him. I could see him up the road, but it was quite a way up there. I kept thinking, "Dang, I'm going to run out of room." but immediately after, I thought, "Then don't run out of room and catch him!" The only time I had to tell how far back I was was at the turnaround and he was about 1:10 ahead. I had cut 50 seconds in the first half and knew it was going to be close at the end. On the way back, someone told me that Louis was struggling and that he could hear him breathing hard. I could tell he was slowing noticeably because I seemed to be reeling him in faster. With just over 1.5 miles to go, he still had 30 seconds on me and I knew I was going to have to push it if I wanted to catch him. Then with just half a mile left in the race, I knew he was going to get me. I was just too far down, but I still ran hard to the finish. He ended up getting me by 14 seconds (darnit T1!) This was the third time that Louis has beat me in a race by less than 20 seconds. I swear, one of these days I'm going to beat him haha. It's nice to have a little one-sided rivalry to push me to go faster, though. 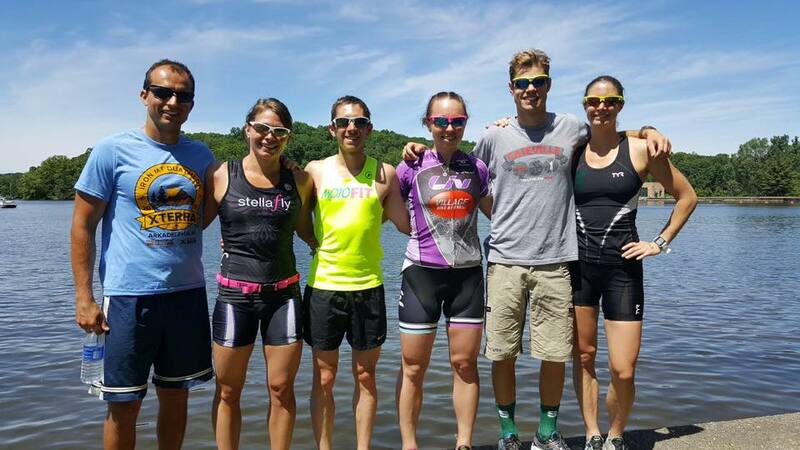 Congrats to Sara on her first triathlon! Louis was so fast, he left before the awards ceremony! 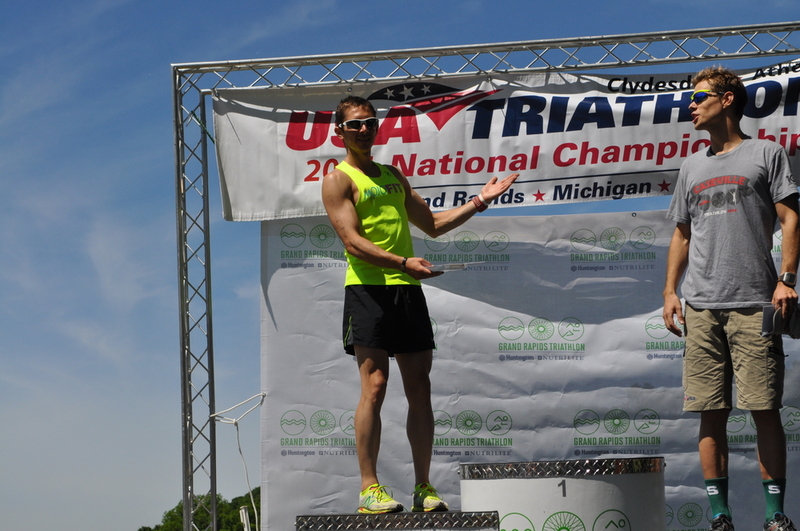 High-five for Todds on the podium! The whole crew post-race. I'm rocking my MojoFit singlet of course! Uppercase Todd finished strong and rounded out the podium with Louis and I. On the women's side, Sam had a great race and finished 2nd. In the half-iron race, my friend Ryan Giuliano took home the overall win crushing the run in 1:12 and change...freaky fast! Eric Abbott also had a solid race, but struggled with a muscle cramp near the end of the bike. He pushed through though and finished strong! 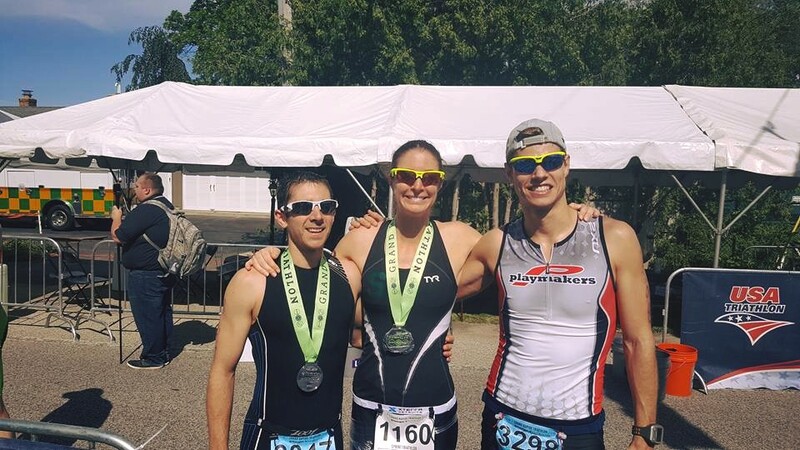 In the sprint, friends Kyle, Abby, and Sara all had strong races and this was Sara's first ever triathlon! Yay Sara!! After the race, we all enjoyed some custom oatmeal, cherry, chocolate chip cookies from Rise Grand Rapids. (And yes, I did share!) Fantastic as usual Nick! Thanks to Todd, Sam, and Sara for putting up with me pre-race at Todd's parent's house. And thanks to Alex and Colleen Kennedy for letting me crash at your house and making a delicious pre-race dinner of spaghetti and garlic bread. Yummm carbs! Thanks to the guys at MojoFit for their unwavering support. Matt and Mark, you guys are awesome! Pro-tip: you're never too old to have your mom put sunscreen on you! Rocking our matching MojoFit shirts!